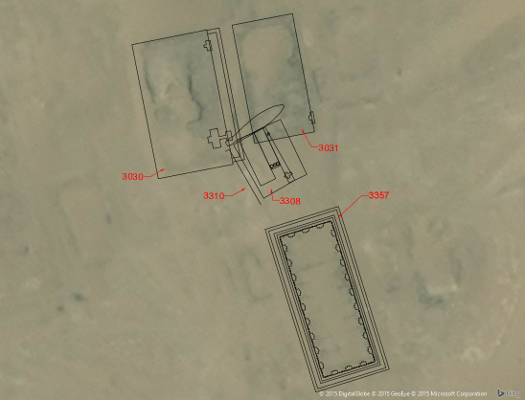 Throughout the (ongoing) process of compiling a comprehensive GIS of the North Saqqara necropolis I have encountered a number of errors and omissions which have been printed and quite often repeated in various maps of the archaeological site. 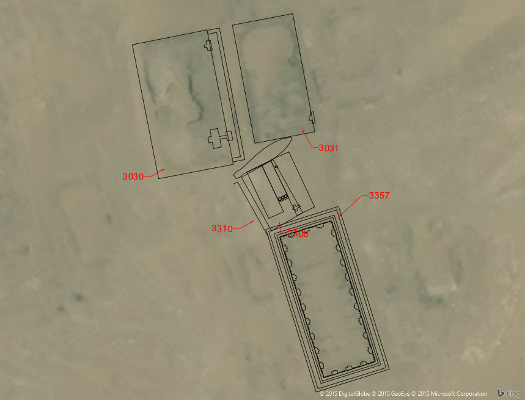 A recent conundrum that befell me came from the location of the boat-grave and model estate of mastaba tomb S3357. W.B. Emery discussed tomb S3357 in Archaic Egypt (1972, 54 – 56), though unfortunately not in any great detail, but he did provide a plan and section of the tomb (Emery 1972, 55). To the north of the mastaba Emery discovered a brick-built boat-grave which once contained a wooden solar bark (Emery 1972, 54) which he associated with the mastaba. In Great Tombs of the First Dynasty II he discussed the model estate that was discovered between the boat-grave and the mastaba tomb, constructed on the First Dynasty ground level and therefore presumed to be associated with both (Emery 1954, 171). Plan of the model state and boat grave in relation to tomb S3357 as published by W.B. Emery. Having already studied the plan of the location of the boat-grave and model estate in relation to S3357, my suspicions that something was wrong with their location on the plan were justified when I had drawn up and georeferenced the plan of the mastaba and two other mastabas, S3031 and S3030 (dated to the 2nd Dynasty and 3rd Dynasty respectively) located immediately north of S3357. Emery’s well drawn and detailed plan situates the model estate and boat-grave complex some 13.5m to the north of the northern facade of mastaba S3357, but there simply is not enough physical space between this tomb and tombs S3030 and S3031 for this to be correct. The date of discovery of the two later mastabas (as determined by their numbers, which represent the year and number of tomb discovered during that year, so 1930, discoveries 30 and 31) would suggest that they should have been known by Emery during his excavations in 1937 when he discovered the model estate. I considered the possibility that the model estate and boat-grave were not First Dynasty structures and had overlain the later mastabas, but this approach did not fit with Emery’s observation that they were constructed on the First Dynasty ground level. Curiously he made no mention of the other mastabas. However, he did note that the boat-grave and model estate had been overlain by two later mastabas 3008 and 3010 whose positions were shown on his plan. I then considered that perhaps the later mastabas were no longer extant and that they were stratigraphically above the model complex, but when satellite imagery was included it was clear that the, albeit denuded, superstructures of these later mastabas were present. They do not match with the size, position or orientation of the partial plan of tomb 3010 and plan of tomb 3008 as shown by Emery, so I have discounted confusion over the tombs and numbering. So the only thing left to do was to reposition the model estate and boat-grave closer to mastaba S3357 within the available space. This repositioning is open to question as there is no feature outline visible on the satellite imagery and so it remains a tentative placement. However, when repositioned between the mastabas the distance from the edge of the model estate to the outer wall of S3357 is close to 1.3m. Could the confusion lie in a numerical error, the transposition of the decimal point? Until (or if) more information becomes available this remains my working solution. Emery, W.B. 1954. Excavations at Saqqara. Great Tombs of the First Dynasty II. London: Egypt Exploration Society. Emery, W.B. 1972. Archaic Egypt. Harmondsworth: Penguin.